Wow, the Cloud Master’s a real sociopath. Consider: Mike Chen seeks to become the Cloud Master, and yet, he has already tamed a cloud to carry him where he wills. Truly this ability to ride a cloud is evidence of some sort of Cloud Master-dom? But no, Mike Chen isn’t satisfied with such a small cumulus. It’s up to you to carry him through the Five Lands of Mystery, destroy those who oppose him, and gain him power, prestige, and eventually, the One Cloud to Rule Them All. You start off on Mt. Gogyo with Mike situated atop his cloud. Your weapon is Ki, which comes in the form of two balls that spew rapidly from the cloud. And rapid spew you will, if you hope to take down the birds with human heads, curry bowls, turtles, pig heads, cat heads, monkeys, snipers, and other curious creatures of the Five Lands. There are land-based enemies and ground-based enemies, both of which spew tiny flickering red projectiles that are difficult to see. Mike isn’t the smallest puff on the cloud, either, so navigating him around both the projectiles and the enemies is key to survival, as is acquiring stronger weapons. Certain enemies drop power-ups after being destroyed. These power-ups either enhance your current weapon’s rate of fire, upgrade your weapon completely, or give you automatic fire. As with all shoot-em-ups, should you die, these upgrades disappear, like so many cloud wisps. For Mike’s sake and for his title, stay alive. A brief moment of respite. After a lengthy battle with the level’s foes, you’ll run into a mid-boss riding a giant cloud. They spew lightning at you in several directions and take many hits to kill. Once they’re felled, a door appears that leads to a shop, of sorts (you don’t actually buy anything, but it has a shop setup). The shop has four secondary weapons, many of which vary depending on what level you enter the shop. Secondary weapons include Four Way Magic, which unleashes four fireballs that surround you for a limited time; Snake Fire, which launches a snake that attacks your foes; and Bomb Fire, which spits out small bombs downwards onto the ground. The secondary attacks are assigned to Button 2, and while their presence is welcome, only the stronger forms of magic in later levels are worth using. As with your main weapon upgrades, should you die, these disappear. 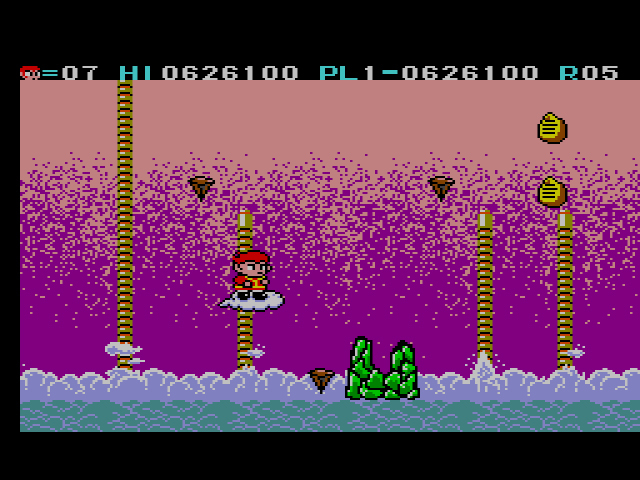 While Cloud Master wasn’t developed by Sega, the boss fights are very similar to Sega’s Fantasy Zone. You’re taken to a separate screen where a boss slowly emerges from the right hand side. While the boss designs are all different – Giant Frog, Buddha with sunglasses, and Angry Samurai among them – they all have a similar attack pattern: fly around slowly (on a much larger cloud than Mike’s, no less) and spew projectiles that you can barely avoid. Their weak points are always highlighted and regardless of your weapon’s strength, it’ll take a good few minutes of continuous shooting to make them go down. The boss designs evoke a laugh, but the battles themselves are unmemorable and difficult. Fantasy Zone did it better. This beatnik Buddha is my personal favorite. And so Cloud Master goes. Take Mike through an ancient mythical landscape, destroy freaky creatures, get stronger weapons, destroy more freaky creatures, fight boss, stay alive. Were Cloud Master a more traditional shmup where you control a ship in space, I wouldn’t give it a second look. The gameplay is solid, but there’s very little depth or replayability. 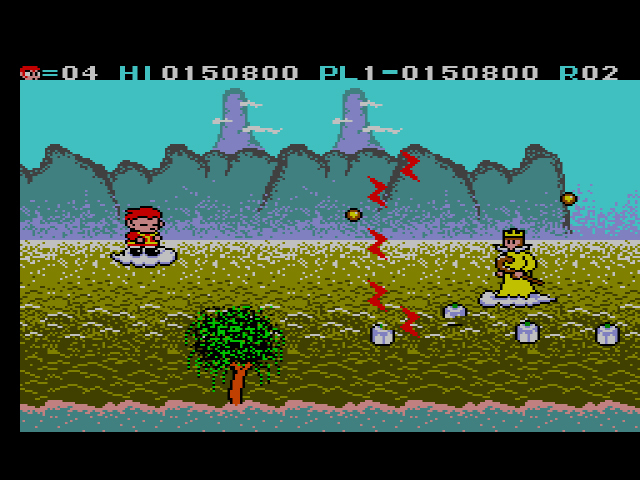 Mike’s large character sprite make the game harder than it needs to be, particularly when you have dozens of enemies and hard-to-see projectiles filling up the screen all at once. 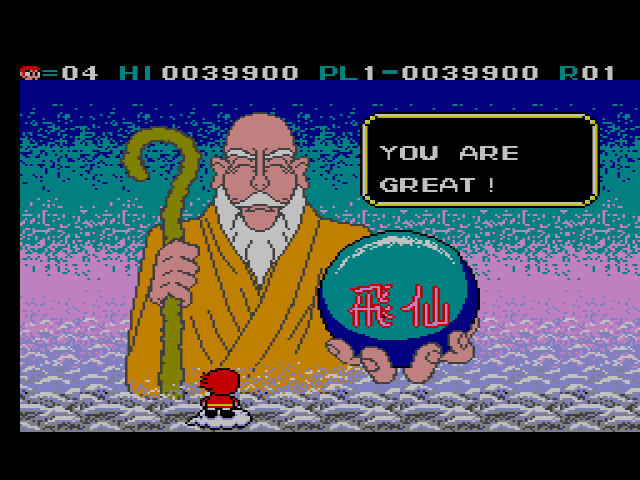 Yes, Cloud Master will make you feel pain, but if you’re compelled to make Mike the True Cloud Master, it’ll be because of the game’s unconventional setting, ridiculous main character, and goofy, lighthearted vibe. Cloud Master isn’t perfect, but it is unusual. Sometimes that’s enough. One thing I love about old school video games is how weirdly random they could be. Like, you could read the manual for this to get the backstory but what’s the point? Kid rides on cloud and shoots at monkeys and cat heads. And that’s all you really need to know. Good times. I’ve always liked the aesthetic of this one. I’ve never played it, but had it on my list due to it’s cool, Chinese mythology-inspired look. I’m sad to read that it’s relatively mediocre, but I’ll probably give it a go anyway. It’s always fun finding “lost” shooters, especially ones that offer something a little different. It’s worth playing if you like shooters, and it definitely offers a few chuckles. This was originally based on an arcade game that looked much better than this. 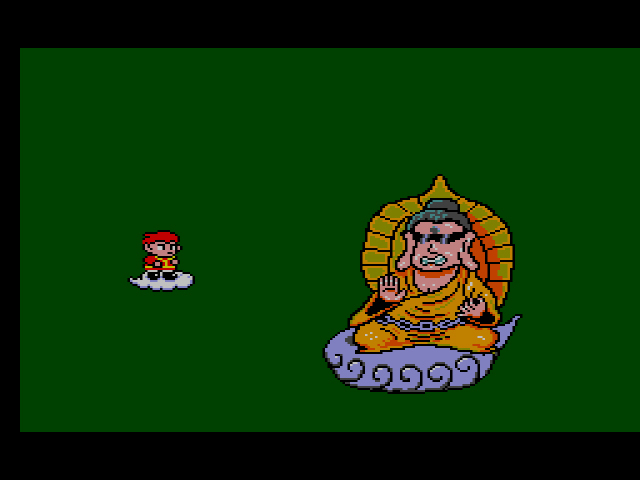 I knew there was a Famicom port and a PC-Engine port of this game from watching Chrontendo. They remade this game on the Wii. And even made a sequel which came out over here as Saint. That was new to me. So I guess this game had some legs with lots of home ports and reimaginings. Weird how something so widespread could be so forgotten, hey? I remember I picked this game up a few years after I had a Genesis. At the time I was not really impressed it it since I had all the newer 16-bit shooters. I recently played this game a few weeks ago and I find it holds up really well. Very decent game for the 8-bit Master System. 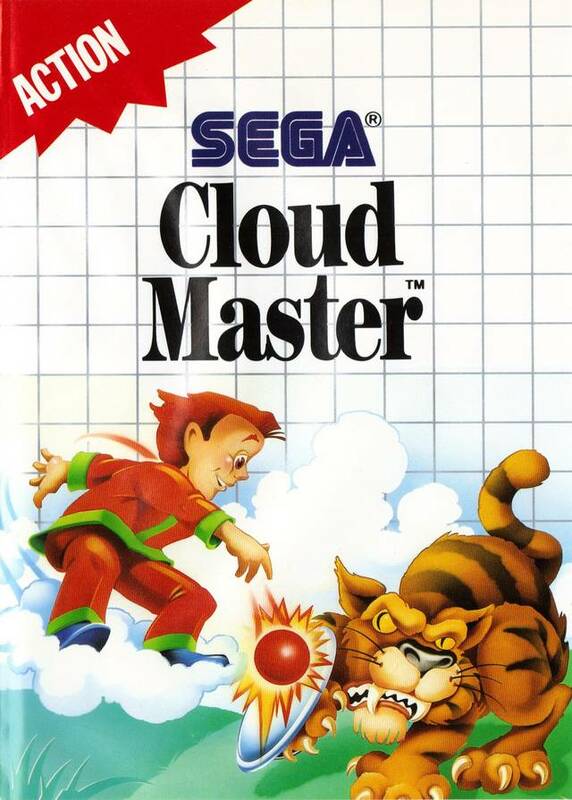 I’m crap at it, but I’ve always enjoyed Cloud Master. I agree that it’s shallow, but it’s got heart! It’s definitely got some neat-o art.